This is a ‘get real’ book. There ain’t no Fairy Godmother! No one is going to come along and wave a magic wand and make that fat disappear. The only person who can do that is YOU. If you want to lose weight permanently and be slim for the rest of your life, this is the book for you. If you have tried every diet ever devised and always put the weight back on again, it’s time to stop and assess why this happens. You obviously don’t do it on purpose. Let’s face it: you are living in the real world where there are parties, family gatherings, holidays and eating out with friends. You need a way of eating that suits YOU and fits in with your lifestyle. Lee’s book will show you how to do just that. Prepare to live the rest of your life as a slim person. To buy this book, please visit our Online shop. If you recognise the destructive cycle of dieting – craving – bingeing – guilt – anger – misery, this book allows you to take control of your life, rather than letting your life be controlled by food. 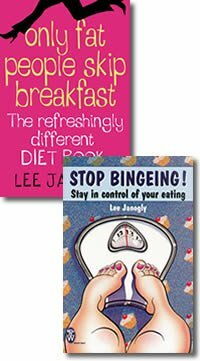 Lee knows how bingeing can affect your life, your health, your self-esteem – and your weight! Her informative, sympathetic and inspirational book contains a simple six-point plan to follow and includes lots of case studies revealing just how others in your situation have beaten the binge for good.